Be the first to share your favorite memory, photo or story of Terra. This memorial page is dedicated for family, friends and future generations to celebrate the life of their loved one. 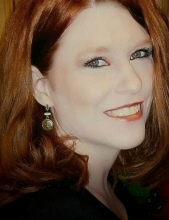 Terra Jane (Crawford) Parrish, 42-year-old former Vinita resident, passed away Saturday, February 23, 2019 at her home in Chouteau. She was born on May 19, 1976 in Vinita, to Terry and Janie (Friend) Crawford. Terra was a graduate of Vinita High School, NEO A&M College with her Associates in science and nursing, Northeastern in Tahlequah with her BSN degree and lastly, Oklahoma University where she received her Master’s in science and nursing. She was an ARNP for the Cherokee Nation and Craig General Hospital. Terra had a passion for riding horses, hunting deer, fishing and spending time at Grand Lake. She enjoyed researching anything to do with the medical field, sharing time with family and friends. Most of all she loved God and was a devout Christian. She was preceded in death by, two grandfathers, a grandmother and the father of her children, Shawn LaPrairie. The family includes; her husband, Steven Parrish of the home; parents, Terry and Janie Crawford of Vinita; children, Christopher Logan Laprairie, Alexander Cole LaPrairie of Chouteau; step-siblings, Steven Christopher Parrish of Adair, Elijah Michael-Julian Parrish of Claremore, Mackenzie Faith Parrish of Pryor; a brother, Jason Crawford of Vinita; grandmother Ruby Crawford of Pittsburg, Kansas, mother in-law Ona Parrish of Vinita; numerous aunts, uncles and other relatives. The family will receive friends from 6-8 PM on Friday, March 1, 2019 at the Burckhalter-Highsmith Funeral Home. The celebration of life will be held on Saturday, March 2, 2019 at 10:00 AM at Isaiah 58 church in Vinita, with Pastor Bobby Wisdom officiating. Interment will follow at the Pleasant Valley Cemetery west of Four Corners. Online condolences may be made at www.highsmithfh.com or on our Facebook page. Arrangements are by the Burckhalter-Highsmith Funeral and Cremation Services of Vinita. To send flowers or a remembrance gift to the family of Terra Jane Parrish, please visit our Tribute Store. "Email Address" would like to share the life celebration of Terra Jane Parrish. Click on the "link" to go to share a favorite memory or leave a condolence message for the family.